Carrie Haddad is pleased to present this rare Sculpture Exhibit featuring works by Stephen Walling, Linda Cross, Roger Phillips, Birgit Blyth, Joseph Maresca, and Amy Podmore, with an artists’ reception on Saturday, December 15th from 6-8pm. All are welcome to attend. On display will be an array of multi-dimensional objects from multi-faceted artists with an emphasis on the multi. Birgit Blyth, a photographer who typically works in alternative processes, knits thin gauge wire into delicate wall sculptures. Blyth’s sculpture works as a 3 dimensional companion to her 2 dimensional chromoskedasic photographs, sharing a similar color palette and grid like pattern. Stephen Walling, a former graphic designer and art director turned sculptor makes wall relief sculptures from painted wood blocks and scraps fitted together into beautiful grid patterned Joseph Maresca, also a painter, has been making 3-D cut-outs & painted constructions that reference the Hudson River and surrounding landscape. Roger Phillips exhibits constructivist maquettes in primary colored enamel on stainless steel which are replications of larger sculptures. Many of Philips works are kinetic and commissioned for outdoor use and an invited interactivity with their surrounding environments. 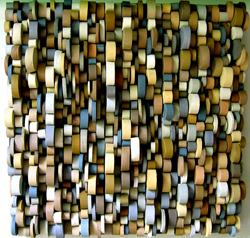 Linda Cross, known for her large sculptural installations, will be exhibiting small wall reliefs titled “Fragments”. She uses paper, paint, and Styrofoam to imitate riverbed rocks, tin cans and bricks in her ongoing natural history series. Combining the physicality of sculptural forms with illusionistic realism, Linda Cross contrasts an abstract wilderness with the pervasive intrusion of civilization. In contrast to Cross’s focus on nature, Amy Podmore creates a world of human imperfection in her sculptures of slightly grotesque “specimen” figures under glass domes. Both Cross and Podmore present their works as if they are meant for scientific examination, adding an aspect of discovery into their respective worlds.